Internet Service Providers (ISPs) sell access to the global Internet as a service "Internet Transit". Since the Internet is a network of networks, to provide this service ISPs must somehow themselves connect to the Internet. There are two ways to accomplish this: 1) purchase transit from an ISP that already has access to the global Internet and/or 2) negotiate" peering" with other ISPs in order to reduce the cost of transit. The Peering Simulation Game is based upon the research ("Internet Service Providers and Peering" and "A Business Case for Peering") that documents ISP peering practices, motivations, and strategies, and was designed to demonstrate ISP peering negotiations through a live simulation. In this simulation, four audience members play the role of ISP Peering Coordinator, rolling the dice and growing their network by acquiring customer "squares" on a virtual game board. They receive money for each square they occupy but must pay transit fees to their upstream ISP to access the rest of the "Internet". By negotiating peering, the Peering Coordinators reduce their transit costs. The goal of the game is to maximize their bank account. Since the ISPs both cooperate in peering to reduce costs and compete to maximize their bank accounts, this game has proven to bring forward peering negotiations strikingly similar to peering negotiations in the real world. The Peering Simulation Game has evolved since 2002, having been presented in over 40 International forums on 5 continents by the author and by 40 other instructors as part of AfrISPA IXP training in over 18 countries. This paper presents the game and its rules, along with lessons learned from running the simulations and saving the game boards internationally. The Peering Simulation takes place in a fictional Internet that we will call "BillLand". BillLand consists of a small number of ISPs that all start out endowed with venture funding of $35,000 . Since ISPs by definition sell access to the Internet, they must themselves get connected to the Internet. The ISPs attach to the Internet by purchasing "Transit" from one of two Transit Providers that service their region. But Transit providers charge for this service, with monthly fees proportionately to the size of the Internet . Therefore, the ISPs are motivated to "peer", (directly interconnect their networks) in order to reduce the amount of transit they need to purchase. But there is a cost associated with "peering", so the ISPs need to negotiate how to cover the cost of peering. Once peering is set up, the two ISPs do not need to pay transit fees to access each other customers. In Bill Land, all activities take place in the open , all negotiations take place in public , and all players are omnipotent in the sense that they all know each others standing in the game. The Internet is still unregulated but there are a few rules that are enforced by the ruler of Bill Land, namely me . 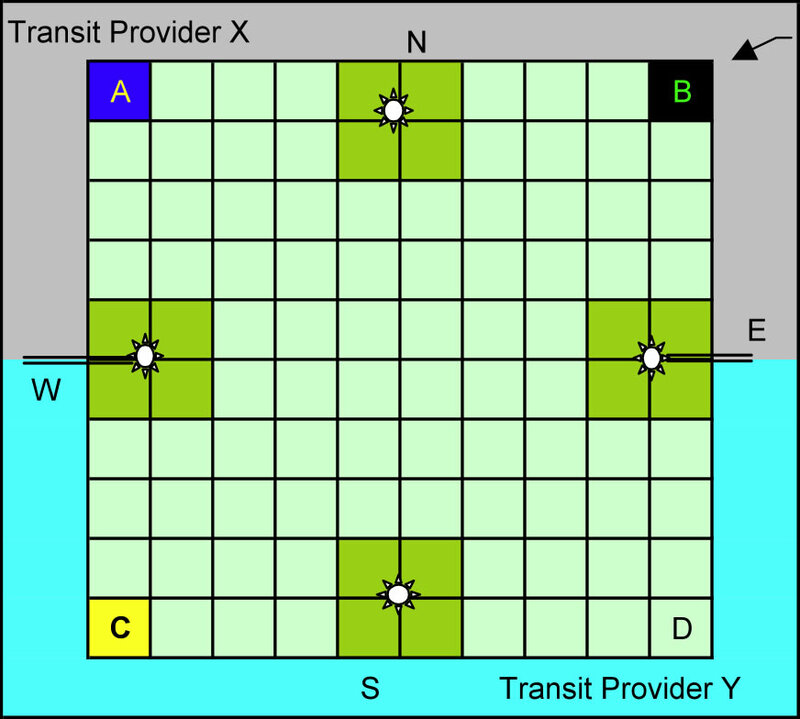 The Transit Providers (X & Y) shown on the board are not real players in the game but represent the upstream ISPs selling transit access to the other ISPs in the Internet for a metered per-square transit fee. ISPs compete to maximize their bank account. Revenue is earned through the acquisition of "squares" of customers. Revenue. Each square the ISP sits on yields $1000 in revenue. Transit Fees. Costs include "transit" fees proportional to the number of squares that other ISPs occupy, specifically, $2000/square that other ISPs sit on. 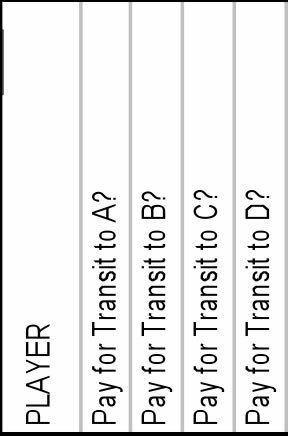 For example, if ISP B, C, D collectively sit on 10 squares, the transit fee for ISP A is 10 * $2000/square or $20,000 for that turn. Peering. Costs can be reduced by establishing "peering relationships" with other players, eliminating transit fees to access each others squares. See "Peering Negotiations" for details on how this works. The winner is the player with the most money at the end of the game. Each ISP does the following in turn. The ISP rolls the die (representing the regional marketing campaign success) and acquires the number of squares indicated by the die. ISPs can only acquire squares adjacent to or diagonally from a square the ISP occupies. If the ISP is in an exchange point with other ISPs, he can attempt to establish a peering relationship described later. Put the roll of the dice in the spreadsheet "Roll" column. The revenue and transit fees will automatically be tallied. If the ISP is occupying a square in an exchange point with other ISPs, the ISP can attempt to negotiate peering with the other ISPs located there. Described next. The Excel Spreadsheet Score Board is shown below. B)	the loss of 2 turns to implement Peering Installation Both of these expenses are split however the ISPs negotiate. 2. The peer can accept or reject the terms, or offer alternative terms. The lost revenue is used to model the paying of Internet Exchange Point fees, and the lost turns reflect the costs of building into an IX rather than acquiring customers. 3. Once the negotiation is finished, the ISP can negotiate terms with ISPs at the other exchange points where they are collocated. If peering terms are agreed upon, the effects of the terms (the loss of turns and payment of Peering Fees) are implemented starting Next Turn. That is, the turns that are lost, the peering costs paid, and the benefits of peering realized (elimination of transit fees to access each others squares) are implemented starting next turn. The spreadsheet automatically handles most of the calculations but the settlement is a bit tricky. To help, there is a peering matrix on the right hand side of the spreadsheet. This matrix indicates who has to pay transit fees to access whose squares. Note that initially each player has a '1' that indicates that they have to pay transit fees to access each others network. Where X is the ISP whose turn it is, and is the ISP whose turn it is, and Y is the ISP with whom the peering is established. Note that this is to be entered in the Next Turn Peering Cell. This follows the rule that the Peering Costs and benefits take place the next turn. For both ISPs, enter this in the next available turn Peering cell. Note that the Roll automatically is set to '0', indicating a lost turn. The Peering Costs are also increased by $1000. The spreadsheet assumes the costs are split evenly. Many times the Peering arrangement is split evenly. In these cases there is nothing special to do. If the Turns are split unevenly then you need to accept the way the spreadsheet sets things and then go in and patch things in manually. The Peering Simulation Game brings light to the otherwise elusive world of ISP peering negotiation. Winning ISPs generally are one who have effective marketing campaigns (roll the die well) and pursue peering as quickly as possible to reduce the cost of delivering services (transit) to their customers. The benefits of peering are realized through the entire run of the game, so generally the longer the game the better the peering population does. This matches reality fairly well. The whole focus of the Peering Simulation Game is the negotiation and the relative power that each ISP wields in the negotiation. Participants quickly learn that transit expenses get to be very large, and they are strongly motivated to negotiate peering with their competitors. Larger ISP networks benefit less from peering than the smaller ISPs, since their transit fees paid to access the smaller ISP are less. This leads to the asymmetric settlement of peering costs and in many occasions failed negotiations. The Peering Coordinators researched indicate that these negotiations in the game are strikingly similar to those in the real world. As in the real world, personality conflicts and the desire to 'win' often prevent Peering Coordinators from realizing a mutually beneficial peering relationship. Ultimately, peering saves money, but the roll of the dice has led to non-peering winners. There is a strong first mover advantage. The later stage players come in with larger transit fees and greater motivation to peer than the first ones to move. The game inspires conversations and debates. This has turned out to be a great community builder and educational tool on Peering. ISPs move serially in the game, while in the real world action is parallel. The meaning of the board squares is severely overloaded to mean regional coverage and corresponding revenue, a quantum of traffic generated, and a quantum of traffic transmitted all others. All customers are not equal in revenue, traffic. Customer transit revenue gained does not cause any additional financial load for the ISP in the game. Everyone starts with the same number of squares. Everyone is financially backed to support infinite periods of financial loss. Well, that may reflect reality for some period of Internet time. If ISPs fail to peer they must pay transit to get access to these squares. In reality, content multi-homes allowing alternative paths to the same content. Business motivations to sell transit instead of peer are an ignored dynamic in the game. I would like to thank all the people who played the Peering Simulation Game and provided feedback and suggestions for the game. In particular I'd like to thank the following people for their contributions: Ren Nowlin (SBC Internet Services), Michael Shiu (Hutchison Global Crossing). Who is William B. Norton? WIlliam B. Norton is the author of The Internet Peering Playbook: Connecting to the Core of the Internet, a highly sought after public speaker, and an international recognized expert on Internet Peering. He is currently employed as the Chief Strategy Officer and VP of Business Development for IIX, a peering solutions provider. He also maintains his position as Executive Director for DrPeering.net, a leading Internet Peering portal. With over twenty years of experience in the Internet operations arena, Mr. Norton focuses his attention on sharing his knowledge with the broader community in the form of presentations, Internet white papers, and most recently, in book form. From 1998-2008, Mr. Norton’s title was Co-Founder and Chief Technical Liaison for Equinix, a global Internet data center and colocation provider. From startup to IPO and until 2008 when the market cap for Equinix was $3.6B, Mr. Norton spent 90% of his time working closely with the peering coordinator community. As an established thought leader, his focus was on building a critical mass of carriers, ISPs and content providers. At the same time, he documented the core values that Internet Peering provides, specifically, the Peering Break-Even Point and Estimating the Value of an Internet Exchange. To this end, he created the white paper process, identifying interesting and important Internet Peering operations topics, and documenting what he learned from the peering community. He published and presented his research white papers in over 100 international operations and research forums. These activities helped establish the relationships necessary to attract the set of Tier 1 ISPs, Tier 2 ISPs, Cable Companies, and Content Providers necessary for a healthy Internet Exchange Point ecosystem. Mr. Norton developed the first business plan for the North American Network Operator's Group (NANOG), the Operations forum for the North American Internet. He was chair of NANOG from May 1995 to June 1998 and was elected to the first NANOG Steering Committee post-NANOG revolution. William B. Norton received his Computer Science degree from State University of New York Potsdam in 1986 and his MBA from the Michigan Business School in 1998. The Peering White Papers are based on conversations with hundreds of Peering Coordinators and have gone through a validation process involving walking through the papers with hundreds of Peering Coordinators in public and private sessions. While the price points cited in these papers are volatile and therefore out-of-date almost immediately, the definitions, the concepts and the logic remains valid. Please provide us with feedback on this white paper. Did you find it helpful? Were there errors or suggestions? Please tell us what you think using the form below.